Learn about ocean species and their fascinating nighttime behavior. Participate in fun games and crafts, meet marine animals up-close in the touchpool and unwind with marine movies in the theater. Space is limited and pre-registration is required. Group size is limited to 20. Enrollment is on a first-come, first-served basis. Your payment is your reservation. 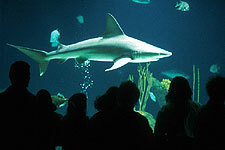 No refunds for Aquarium Overnight ticket purchases.